Poker is one of the most popular card games in the UK and here at Harlequin Fun Casino, we have full size, authentic poker tables to hire for private poker nights and poker tournaments. Private house party poker nights are absolutely great fun for you and your guests and are a perfect idea for Stag nights, birthday parties or annual club dinners. The beauty of playing in your own venue is the convenience and laid back atmosphere. You make all the rules! Roulette and Blackjack are the perfect games for parties and weddings as they are fast paced and easy to dip in and out of, but poker is more suitable for a more subdued event with fewer people, as the game is far more intense and demands a bit more concentration. 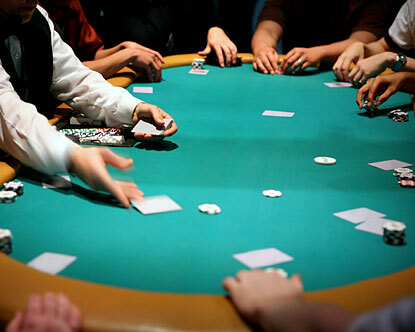 Poker games can last a long time, too, so they’re not the ideal tables to hire for lively party atmospheres. To ensure our games are as authentic as possible, we source all poker chips and cards from Las Vegas. For advanced bookings, we can even order playing cards from your favourite Las Vegas casino, or have personalised plastic or clay poker chips made to your exact specifications. Our tables look fabulous and our dealers have an intrinsic knowledge of the game so you can be sure your poker experience will be as smooth and as authentic as possible. For an extra treat, why not hire a cocktail waiter or waitress to ensure you and your guests have a plentiful supply of drinks and snacks throughout the night? If you’re planning a poker game, a poker tournament or a corporate poker tournament, why not get in touch and see what we can do for you.